There’s a line of thought that suggests everybody has a doppelganger roaming the Earth somewhere and, as it turns out, Arsene Wenger’s genetic twin just so happens to be the manager of the Malaysian national side! We can’t take any credit for this spot mind – that lofty accolade goes to the guys over at KCKRS. …….. and there’s me thinking an ageing Eduardo had come back to the Gooners!! lol! Malaysian Chelsea fan here. Was at the Malaysia vs. Arsenal game last night. Was wondering when someone would point out this resemblance. The Malaysian team resembles Arsenal in more ways than one too – petite players, prone to good starts with cringing closing performance and fannying about around the penalty box under the pretense of scoring. Except that Arse put four past them yesterday. Small’er’ twin you mean. Guy’s still got a decent height on him to be called ‘small’. 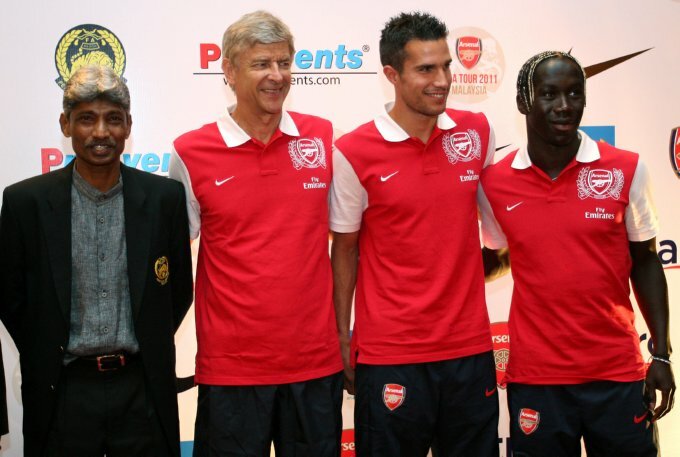 I think that Pia Sundhage looks more like Wenger than this little dude. Did you see her on the sideline in the Nike Parka? Separated at birth, I tell ya.